Window to the Heart Saga: a recountal of the epic journey of Lady Margaret, a young English noblewoman, who through many trials, obstacles, and tragedies, discovers her own inner strength, the sustaining force of faith in God, and the power of family and friends. In this three-part series, experience new places and cultures as the heroine travels from England to France and completes her adventures in America. The series has compelling themes of love, loss, faith and hope with a exceptionally gratifying conclusion. 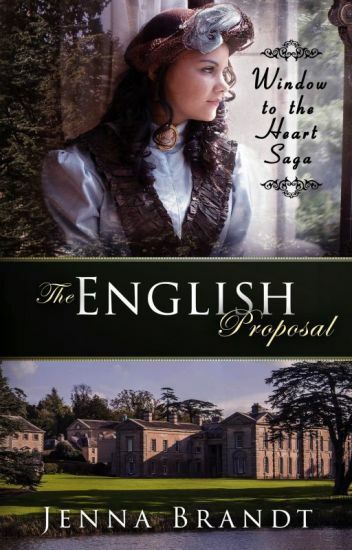 The English Proposal (Book 1). Sheltered on her family's country estate, Lady Margaret, the daughter of an English Earl, is betrothed due to a family promise. Although Henry, the Viscount Rolantry, has been her best friend since childhood and she is expected to marry him, she never felt butterflies until she meets the Duke of Witherton. Against her father's wishes, Margaret finds herself captivated by the forbidden duke. Caught between family loyalty and her own wishes, Margaret searches for a way to satisfy both her responsibilities and her longings. When tragedy strikes, Margaret finds herself seeking answers at church. But when she finally makes her choice, through her newfound faith, will she be able to live with the repercussions of her decision? To follow the heart or the head-torn between two men-which future will Lady Margaret choose? Profoundly romantic and superbly riveting, The English Proposal explores the conflict between fulfilling duties and satiating desires. Margaret Doria Vickers is the quiet yet independent-minded headmistress of a girls' seminary just outside of London. She believes herself to be pleased with her retiring life, until the Byronic owner of the school arrives, bent on taking up residence alongside the boarders in his dusty old quarters. Edgar Thurlow is a man of many mysteries, who disturbs Margaret's peace of mind and sparks gossip among the servants, though in reality, he means only to mollify his memories with gentler moments, withdrawing himself from the artificial London society he so deeply despises. Even as his bad habits are gradually revealed to the observant headmistress, a strong understanding crystallises between these two social outsiders. Edgar's past proves too strong to compartmentalise, and it distracts and torments him from any present comforts. In the meantime, Margaret's sister Tilly, who is a governess, comes to visit her, which brings back some of Margaret's long neglected memories of a carefree youth. In spite of the exasperations she feels toward Edgar's behaviour, Margaret finds herself seeking him out, and enjoying his unconventional company in the midst of unwanted attentions from old suitors and thoughtless affectations of a naïve younger sibling. She finds him refreshing, and a sort of character out of time that does not appear to fit in anywhere, much like herself. Perhaps Margaret will be the making of his good character - or perhaps he will mature on his own terms, just as she must do. When Miss Diana Dashwood accepts an invitation to Lady Prescott's Christmas party, things do not go quite as she imagines. Through an unexpected event, she is forced to spend the night in a woodsman's hut with one of the guests. What a scandal! Of course, Sir Gareth Blakely must propose, and he does. Unfortunately, Miss Diana Dashwood has already been engaged to and broken off her engagement from Sir Gareth Blakely after a bitter quarrel. Is it likely she will bow to social pressure and accept his proposal, one made only to save her reputation, and if they marry, does their union stand a chance of survival? And what about the pretty heiress, Miss Jemima Plymstock, whom everyone thinks is the lady Sir Gareth had his eye upon? Headstrong and proud, Miss Diana Dashwood is caught in a dreadful dilemma! The story of fated love between the most feared pirate that navigated the seven seas and a humble, ordinary  girl that gets entangled with his world. Fall into a magical adventure of one of the most feared Pirate, Captain Bayou, and a humble girl, Crystal Bay. A fairy tale, that will bring the best and the worst in everyone. A true love that is tested beyond anything, and a magical realm, where magic and supernatural elements, is as normal as breathing. Another world, where anything and everything is possible. A destined love with a time limit or so they thought.... Will they survive a curse that involves blood, death, supernatural powers and a dark secret that can break them apart? Follow how their love and destiny together develops, how an evil king, ghost and other pirates try to stop destiny from happening. Will they triumph over their enemies? Will love  prevail? Welcome to the Witch's Pirate where a new love story opens up. The Witch's Pirate is an epic story, that goes beyond any Fairy Tale has ever been told. Book Two: The Witch's Bond! A guide to Regency England for readers of classic literature or historical fiction set in the early 19th century. England, as it was in the early 1800's, can sometimes be as confusing to a modern reader as travelling to a foreign country. Their clothes, manners, methods of transport, money and even some words they used can be unfamiliar to us today. I hope this book will grow into a helpful source of reference for any reader who is exploring the classic authors, like Jane Austen and Maria Edgeworth, or enjoying the wide range of early 19th century set historical stories found here at Wattpad. Life for cowboy Mack Rosenberry was nothing but peaceful in the small town of Texas. But an encounter with mysterious guests threatens the tranquility as they seem to have secrets that endanger the town. As Mack aims to discover the purpose of their visit, he finds there is more to the father-daughter duo than they lead on. Join Mack as he discovers the new world with flying machines and clockwork men. This is my first Steampunk themed story. It takes place post the Mexican-American War, I hope you guys enjoy it! It's 1426 and Bella's past is the least of her worries...... With her father The Lord of Warrtishier not only pushing her into a marriage she is completely against but to the one and only Alexander, The Lord of countershier! The big headed fool that sticks him hand into every pie in England. Book 2 of Chivalry  Her families being held hostage in their own estate by highway men who come to take all of the family estate fortune another notorious highwayman has other plans in mind when it comes to Lady Honoria daughter of the wealthy viscount . Little did Lady Honoria is known she'd caught the eye of the notorious highwayman she'd heard tales about taken along against her own will she had been blindfolded as well as her family she felt herself being carted away unknowingly if her family was about. What will become of Lady Honoria ? Will she catch herself falling for the infamous Lock Hart? Benjamin Weathering has inherited the lofty title of marquis, but with that comes a responsibility to interact with his least favorite species: people. Luckily for Ben, he can avoid most interaction by playing hermit at his estate in Yorkshire. He may be everything a woman of the ton looks for in a husband--titled, wealthy, and pleasing enough to look at--but he is in no mood to humor his eligible neighbors by participating in the ghastly mating rituals of dancing, dining, and displaying his intellect. Geranium Massey, renamed Gerry by her favorite sibling, is also of no mind to leap into matrimony. Her elder sisters may all be married and her youngest may be desperate to join them in wedded bliss, but Gerry has better things to do with her time. Namely, she wants to figure out if her neighbor actually controls the weather. The circumstances are suspicious, and frankly she has nothing better to do than observe and try to befriend the young man who does not smile very often but genuinely seems like a good person beneath all those storm clouds in his eyes. And Ben has beautiful eyes, eyes that make her dream of summer showers, eyes that reflect a warm night sky, eyes that always seem to find her in a crowd. Ben wishes he did not look so often at Gerry, for he has no intention of letting her kindness draw him in so quickly, yet look he does. When he is caught looking a little too intently, he and Gerry will have to deal with much more than foul weather if they are to have a chance at happiness. In this story from the (as yet unpublished) collection Lost in the Tale, Janet spends a promised Season in London, with her English father. Will she meet the English tourist who wed her than left her? Not if she can avoid it, though she may need to find him if only to finalise a divorce. The Earl of Medford thinks the Scots girl with whom he had a brief affair in the Highlands must have bewitched him, for he cannot forget her. But his agents say no one of that name exists. And his sister insists he must put the interlude behind him and choose a bride. Can they resolve their differences? And will a child, a cat, a meddling sister and a jealous stepmother help or hinder? [COMPLETE] Hope Edwards had absolutely no intention to find a husband. Cynical and at times unruly, Hope doesn't believe in love nor does she believe in subjecting herself to anyone else's will but her own. Jonathan Langston has known hope since they were children and he had loved her just as long. Ever the optimist, Jon believes he can change Hope's mind when it comes to love, that he can show her what it really means to care for someone as he cares for her. He just hopes he can get to her before George Millbrooks does. Will Hope remain oblivious to Jon's feelings? Will Jon change Hope's mind? Will either of them find a happy a happy ending?